As a physician heavily involved with dying or suffering patients & their families, this series is profound & riveting. 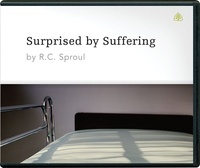 It is powerful as a tool for: 1) understanding suffering, 2) understanding suffering as a Christian, 3) how God is intimately related to suffering, 4) how ALL suffering has a purpose, and 5) how better to deal with my patients' suffering. Anyone (Christian or not) who is suffering and listens to this will also witness a truly powerful case for the Christian gospel.